Lana Turvey-Collins explains the Plenary Council 2020 process to Townsville locals. 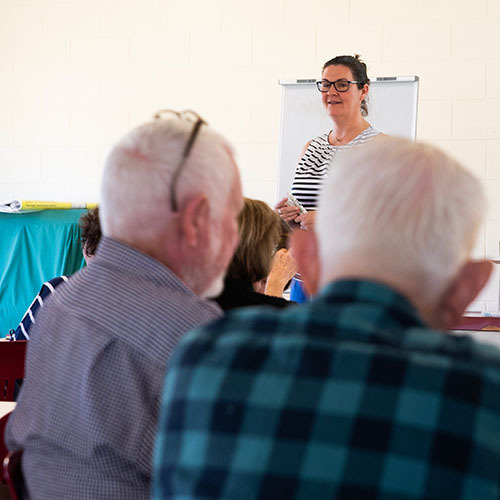 The northern Australia tour continued for Plenary Council facilitator Lana Turvey-Collins recently when delivered five sessions over three days in the Townsville Diocese, presenting to more than 130 people. Geoff Gowdie, Church life and mission services director for the Diocese, saw the opportunity to gather as many people as possible together from a wide range of ministries to gain an understanding of how the Plenary Council will work. Those people can then serve as leaders in their specific ministry or parish. “We were really happy with the number of people that took the opportunity to hear directly from Lana about the process and also gain an understanding how they can go back to their parish and specific ministry and engage with others to spread the message of the Plenary Council,” Mr Gowdie said. Bishop Tim Harris used the sessions to encourage some of those gathered to “be brave” and take this unique opportunity to have their voice heard. “I believe the time has come for the Church to truly pause so it can listen. By listening we learn, by listening we discern, by listening we understand each other better and by listening we can respond better to the new landscape that is now before us,” Bishop Harris said. During the sessions in Ayr, Townsville and Ingham, people came feeling apprehensive of what they would hear and wondering if their voice really would make a difference. They left feeling a sense of hope that this process allowed each and every person’s voice to be heard and their hopes and dreams valued. The Townsville Diocese is establishing a Plenary Council coordinating group, whose task it will be to encourage their individual ministry area to hold listening sessions and make a submission to the Plenary Council over the next nine months. This entry was posted in Uncategorized on June 19, 2018 by ACBC Communications.